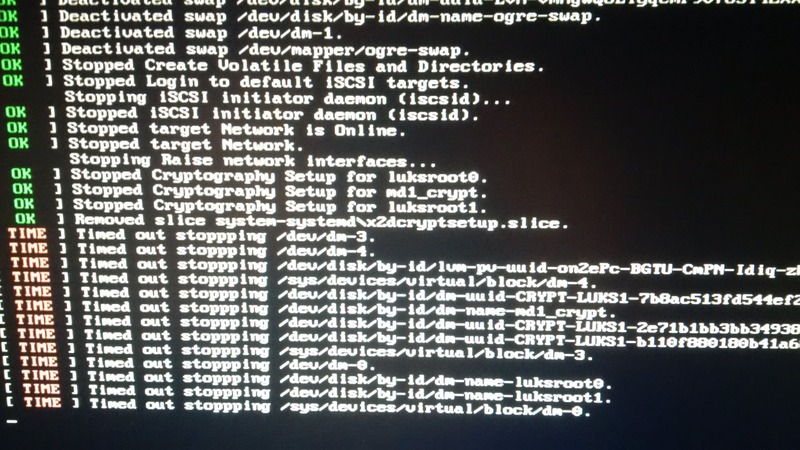 Using the server install ISO, it's possible to specify root on LUKS and variations thereof - for instance, root on LUKS on MD-RAID, root on LVM on LUKS on MD-RAID, and so forth. The installer does the right thing and initramfs-tools does everything necessary to support booting this sort of thing. However, systemd gives a 90-second timeout on restart or shutdown, presumably because it cannot dispose of the things beneath root. It's wholly unclear to me where the 90-second timeout is specified, should I wish to shorten it to reboot without the futile delay, but more to the point, there seems to be infrastructure for handling this kind of situation that doesn't exist in Ubuntu at present. However, Ubuntu seems not to have anything in its initramfs-tools to facilitate "shutdown-initrd" functionality. I haven't tested this, but I suspect this problem will exist for folks running root on MD-RAID without the LUKS as well. Either way, a relatively common vanilla install will force 90-second timeouts on users, which is unfortunate. I just managed to time it right such that I caught the error on my screen, and in doing to noticed a glaring typo that's likely indicative of the overall code quality of the related software. I'd be grateful for debugging tips. I hope Canonical's not going to ship software that punishes LUKS users with these 90-second delays each reboot or shutdown. I'd settle for having a way to shorten the timeout, but systemd seems hopelessly opaque and I haven't found where this is set as yet. Anyway, thanks in advance for fixing this annoyance. otherwise be presumed to be config snippets in a system.conf.d/ directory. 1. I don't blame Canonical for systemd. I just confirmed that I see this on a laptop as well. Conveniently, the laptop install is not using MD-RAID or ZFS - it's using LVM on LUKS on a single disk, so it's a simpler case. > of the overall code quality of the related software. In addition to the typo, there may be an issue where the new setting I poked in is used, but the hardcoded default is still displayed on-screen. I've not been able to capture this on camera as yet, and I have yet to set things up such that all the generated messages are stored for later perusal, if that's in fact possible. The lack of a shutdown-initrd seems to be the more critical issue, in any event. The typos and possible erroneously displayed data on-screen are cosmetic. I'm going to open a seperate ticket for the typo/cosmetic issues noted, so that this ticket can focus on the core. I'll note the ticket number here once I've created it, which I'll do on the other side of my commute. Are there any workarounds for this for already installed Ubuntu installs? I have a laptop user that is having 3+ minute shutdowns for this LUKS timeout issue. Reboots now hang indefinitely with the laptop user. Any update on this? Would it be possible to have pointers to the commit(s) that fixed this? I'm resetting these to Confirmed since it looks to me like Amir may have accidentally set them to incorrect statuses. I have this problem on a system, and it *never* finishes stopping. It prints out a bunch of "timeout" messages about stopping various disks, then hangs forever stopping the crypt disk. I'll try to get an image of it. I managed to discover that by pre-killing a bunch of processes before shutting down, which eventually narrowed down the cause. Lots of messages saying "Timed out stoppping ...". Firstly, I activated systemd's debug shell using 'systemctl enable debug-shell.service'. Then I initiated a reboot and when the problem occured, I switched to debug shell (alt+F9 [/F10 ?] ). Using 'systemctl list-jobs', I figured out what jobs were running while the system hung. One of the jobs was an "unattended-upgrdes" job. This job held one ore more files on my root filesystem open. When I killed that process, the system finished its shutdown and rebooted. 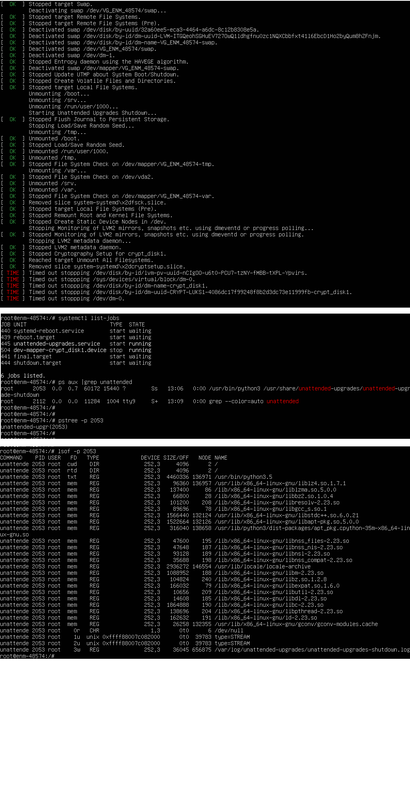 After having removed the package by 'apt-get --purge remove unattended-upgrades' the problem didn't arise again. I am using cron-apt on my servers - therefore I do not necessarily need unattended-upgrades. Hopefully this helps as workaround and to find the real cause of the problem.